The use of solar energy to produce hydrogen can be conducted by two processes: water electrolysis using solar generated electricity and direct solar water splitting. When considering solar generated electricity, almost everyone talks about PV-electrolysis. The process works. In fact, it was first demonstrated at the Florida Solar Energy Center in 1983 under funding through the NASA Kennedy Space Center. Though technologically doable, it is not economically viable yet. Besides cost, there is the question of why use electricity, a very efficient energy carrier, to generate hydrogen, another energy carrier, and then convert it back into electricity again for use? In other words, electricity is so valuable as electricity, our most desirable energy carrier, that we may not want to use it for anything other than that. This is especially true if electricity is made from photovoltaics. PV as an energy source matches the air-conditioning peak load of the nation's utilities. One is much better off using PV electricity as electricity since it is too wasteful to use it otherwise. When will it make sense to make hydrogen from solar generated electricity? The answer is we will want to make hydrogen any time electricity cannot be used - off peak in remote areas, and during seasonal variations. Hydrogen from wind, hydro, geothermal or any other form of solar-generated electricity is valuable when the resource does not match the electrical grid load profile. If solar electricity via PV-electrolysis-fuel cell does not make sense, what about PV-electrolytic hydrogen? In fact, most of the discussion about PV-electrolysis concerns hydrogen production for use as an automotive fuel. Again, this scenario does not appear to be viable. Consider the case of a hydrogen fueling station dispensing 1,000 gallons of gasoline per day, about one-half of the national average. Note that one gallon of gasoline contains just about the same amount of energy as in one kilogram (kg) of hydrogen. Thus, a fueling station will require about 1,000 kg of hydrogen per day. Using the lower heating value of hydrogen, the electrical energy needed to generate one kg of hydrogen is 51 kWh (using an electrolyzer efficiency of 65%). This means that 1,000 kg/day of hydrogen will require 51,000 kWh per day of electricity. The amount of PV needed to supply 51,000 kWh can be estimated by dividing the kWh by 5 hours/day. Thus, 10,200 kWp or 10.2 megawatts of PV power will be needed for operating a 1000 kg/day hydrogen fueling station. Note that 1 kWp requires approximately 10 square meters in area for PV at 10% efficiency. photoelectrochemical water splitting – this technique uses semiconducting electrodes in a photoelectrochemical cell to convert light energy into chemical energy of hydrogen. There are essentially two types of photoelectrochemical systems – one using semiconductors or dyes and another using dissolved metal complexes. photobiological – these involve the generation of hydrogen from biological systems using sunlight. Certain algae and bacteria can produce hydrogen under suitable conditions. Pigments in algae absorb solar energy, and enzymes in the cell act as catalysts to split water into its hydrogen and oxygen constituents. high temperature thermochemical cycles – these cycles utilize solar heat to produce hydrogen by water splitting using thermochemical steps. biomass gasification – this uses heat to convert biomass into a synthetic gas rich In hydrogen. The photoelectrochemical and photobiological processes are those that must be developed in order to meet the long-term energy requirements. Today's systems are less than 1 percent efficient (solar to hydrogen) and they need to reach much higher efficiencies to be economical. Also, there are no large-scale installations of either technology. The high temperature thermochemical cycles can achieve excellent efficiencies (greater than 40 percent), but they must use concentrated solar receiver/reactors capable of reaching temperatures in excess of 800º C. There are a large variety of thermochemical cycles that have been studied. 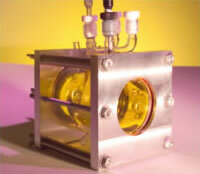 (See Production of Hydrogen by Solar Thermochemical Water Splitting Cycles). Biomass gasification uses heat to change biomass (wood, grasses, or agricultural waste) into a synthetic gas. The composition of the gases depends on the type of feedstock, presence of oxygen, the temperature of the reaction, and other parameters. Biomass gasifiers have been developed as fixed-bed, fluidized-bed, and entrained-bed reactors. All of these direct solar processes have been under research and development and all have still hurdles to overcome.